Egorova, E.; Fernandez, M.; Moon Ho, L.
We propose a new coding scheme for multimedia fingerprinting resistant to noise. Our scheme is based on signature codes for weighted noisy adder channel. The scheme (codes) can trace the entire coalition of pirates and provides significantly better rate than previously known fingerprinting schemes. We also establish a relationship between these two problems and the compressed sensing problem. We propose a new coding scheme for multimedia fingerprinting resistant to noise. Our scheme is based on signature codes for weighted noisy adder channel. The scheme (codes) can trace the entire coalition of pirates and provides significantly better rate than previously known fingerprinting schemes. We also establish a relationship between these two problems and the compressed sensing problem. 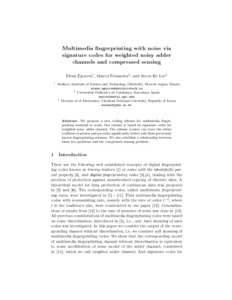 Egorova, E., Fernandez, M., Moon Ho, L. Multimedia fingerprinting with noise via signature codes for weighted noisy adder channels and compressed sensing. A: International Workshop on Coding and Cryptography. "WCC proceedings: The Tenth International Workshop on Coding and Cryptography 2017: September 18-22, 2017: Saint-Petersburg, Russia". 22/09/2017, p. 1-7.